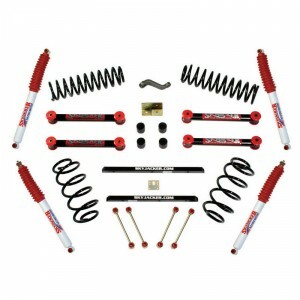 How can you lift your truck or Jeep without spending a fortune on a new suspension system? The answer is a body lift kit. Body lift kits are used by people who want to raise up their chassis, primarily with the purpose of allowing the installation of larger tires without rubbing the fenders. They are sometimes confused with suspension lift kits, but the products are quite different. 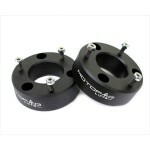 These kits are essentially spacers that lift the body up while keeping the chassis and wheels at the same height. On the other hand, a suspension lift kit raises the entire vehicle and provides more ground clearance. Body lift kits could technically allow more ground clearance by enabling the usage of larger tires, but the kit in at of itself does not provide additional ground clearance. A body lift may be appealing to someone who wants to get larger tires to enable more off-roading with their vehicle. That being said, many of the kits are also for people who just like the look of having their trucks higher off the ground. In terms of benefits, the primary advantage of increasing the stock vehicle ride height is to enable more off-road activities. When it comes down to comparing the benefits of body lifts over other types of lift kits, such as suspension lifts, there are different advantages. One advantage is that the body lift is a significantly cheaper option for lifting the vehicle. 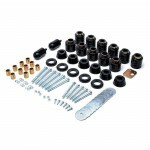 It is also much easier to install a body lift kit in comparison to a suspension lift kit. As mentioned earlier, the body lift does not raise the frame and engine, only the body itself. This has the advantage of not increasing the center of gravity of the vehicle, and therefore maintaining the normal steering performance along with not increasing the risk of rolling the vehicle. In contrast, suspension lifts raise the center of gravity which inherently increases the risk of rollover. 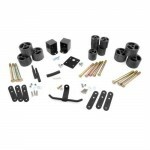 Body lift kits are an aftermarket suspension piece that is very specific to the type of vehicle being upfitted. This is important because the correct pattern for the spacers as well as the number of spacers can vary from one vehicle type to another. Aftermarket manufacturers try to make their kits universal among multiple vehicles when possible such as GMC and Chevrolet trucks, but that is often not possible. Most body lift kits come in the option of being 2-3 inches and the kits will include all the pieces for the complete lift to be performed. The spacers themselves are generally constructed of high density polyurethane materials. There are a number of options for manufacturers that create lifts. The body lift kit in itself is a quite simple product, so many of the review are positive for all of the manufacturers when looking on websites that offer this type of product. It seems that the company having the most offerings is Performance Accessories. 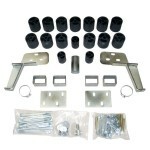 Its most popular product with significant number of reviews is the Performance Accessories Kit for Ford F-150. 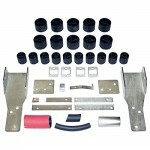 This is a 3 inch lift kits with high pressure fiberglass reinforced nylon lift blocks. This kit also comes with a required steering wheel extension. Another of the popular brands is Rough Country. 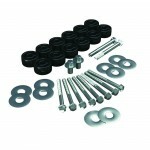 It has one of the popular results which is a 3 inch lift kit for 87-95 Jeep wranglers. 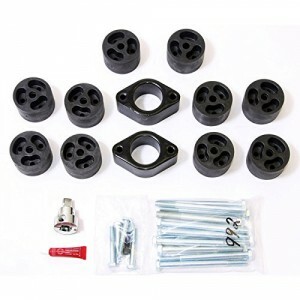 This kit has fiberglass reinforced nylon body spacers along with several other brackets and extensions required to go along with this lift kit. Body lift kits are a nice add-on in case larger tires are wanted, either for looks or for more off-road functionality. Once installed a kit allows for the larger tires which would in effect create more clearance. 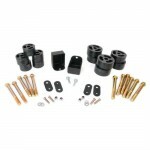 This style kit also has several advantages over other styles of lifts. Some of the advantages include the easier installation and the cheaper price than for most other options, however it also has the added advantage of not increasing the center of gravity of the vehicle.